LAHORE, Nov 16 (APP):Federal Minister for Interior and Planning, Development and Reforms Ahsan Iqbal Thursday said the Pakistan Tehreek-i-Insaf (PTI) Chairman Imran Khan was conspiring for early polls as he was scared of uprising in his party. Talking to the media after the 24th Annual Convocation of University of Engineering and Technology Lahore, he said the PTI’s Khyber Pakhtunkhwa’s members had revolted against their leadership so he (Imran) knew, he would not be able to get success in the general election 2018. “The PTI will lose Senate election 2018 and later on, it will be difficult for it to win few seats in the general election,” he added. months and the Election Commission was unable to hold election before May 2018.
had elected the PML-N in Azad Jammu and Kashmir and Gilgit Baltistan even after a negative campaign against the PML-N.
who were creating obstacles in the way of progress. Ahsan said Imran Khan had not even experience of running a union council, then how he could be able to run a country. in the election 2018 and that was performance. To a question about the killings of 15 citizens in Balochistan, he said an investigation of the incident was underway and commenting on it before the investigation report would be inappropriate. better security there,” he said. He said monitoring at Afghanistan border was being improved and the government was vigilant. China Pakistan Economic Corridor (CPEC),” he said. former prime minister Muhammad Nawaz Sharif involved them in the judicial process on the ethical grounds. “The judicial process has become a joke in the world”, he added. the decision in letter and spirit without wasting a moment but reservations on it was the right of the party. other cases including Maulvi Tamizuddin case and Nusrat Bhutto case”, he added. by Imran and Qadri, whereas Khatm e Nabuwwat (finality of prophethood) was root of every Muslim’s faith. To a question, he said working for Vision 2010, Vision 2025, CPEC and education was his achievement. 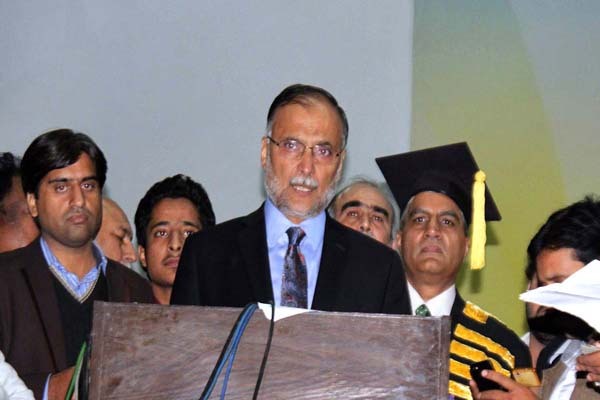 Earlier, addressing the convocation, Interior Minister Ahsan Iqbal said student politics of the UET showed him the way of success. discipline, delivery of results and divine help. and gave away laptops to the students. as soon as it was launched in the world. was considered among the highest growth rated countries. Ph D degrees to the passing out students. Later, the federal minister gave away medals to the position holders of all campuses of the university.